Due to the widespread popularity of theories first expounded in Physiognomische Fragmente zur Beförderung der Menschenkenntnis und Menschenliebe by Johann Kaspar Lavater (1741–1801), eighteenth- and nineteenth-century intellectuals viewed portraits as presenting clear information on a variety of aspects of the subject’s personality—qualities that their usual approach to biography, which focused only on verifiable facts, omitted. This aspect of portraiture is largely lost on modern music historians. 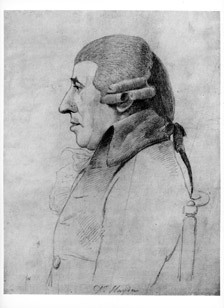 For example, in 1871 the English cleric and writer Hugh Reginald Haweis provided this interpretation of George Dance’s portrait of Haydn (reproduced above): “The face of Haydn is remarkable quite as much for what it does not as for what it does express. No ambition, no avarice, no impatience, very little excitability, no malice.